John B. Atkins was born near Detroit, Michigan in 1835. He passed through Council Bluffs on his way west and in 1859 married Lydia B. Allen in Arapahoe County, Colorado. Their daughter Mollie was born in 1861. Their son Henry Charles was born a year after that in New Mexico. In 1861 John was commissioned as an officer in Company B, New Mexico 1st Infantry Regiment. He mustered out on May 1, 1862. According to his obituary he went to the Pacific Coast to continue mining, an earlier story says he settled in Idaho. Both agree that when he returned east he did so by way of Nicaragua. 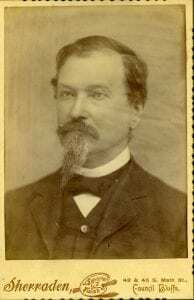 John B. Atkins settled in Council Bluffs in 1866. 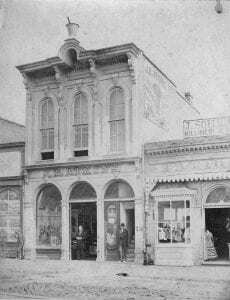 He did business at 351 West Broadway (pictured below) until 1879 when he moved to a brick building at 319 West Broadway. In 1903 His health started to fail, so in August of that year he sold his business to Robert E. Anderson.